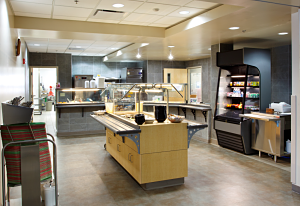 The Cafeteria is open to employees, staff and the public. No evening meal service offered. No salad bar offered on Saturday. The MCHHS Dietary Department provides meals and dietary instructions to patients, residents, staff and community members. Meals are prepared for the Meals-on-Wheels program for the elderly of the community.